Electroplating - Be Cu Manufacturing Compay, Inc.
Be Cu’s customers worldwide have come to expect excellence in Precision Metal Stamping and assembling miniature components. A key factor in our success, since 1944, is our total commitment service from tool design to finishing operations. 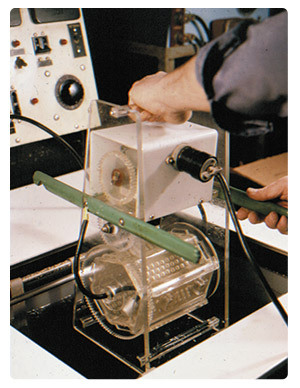 Electroplating is an integral and important part of our manufacturing process. Be Cu handles plating competently and creatively, in keeping with it’s overall emphasis on quality. That well-earned reputation translates into important benefits for your company. Your product’s performance can depend on the integrity of the plating. The optimum plating technique can affect solderability, electrical conductivity and other factors relating to the performance of your designs. For these reasons, Be Cu places a great deal of emphasis on quality plating. You should too! Our specialty is manufacturing parts and assemblies for demanding applications. We utilize beryllium-copper and many other metals to produce electrical/electronic components for aerospace, medical, communications, data processing and other demanding industries. Precision and reliability are the prime considerations. Be Cu’s electroplating shop was originally established as an in-house necessity to serve our growing production needs. It provides us with firm control of quality and turn-around time. Those benefits are yours too, whether we plate your products separately or as a step in our overall manufacturing procedures for you. The manager of our plating department has enhanced his knowledge and skills by handling a vast range of plating assignments over the years. To assure the utmost in quality, this department is fully organized with modern equipment and an array of specialized instruments. These advantages are brought to bear on every part we plate from thicknessess ranging from .0001 to .00003. We are a NADCAP certified plater of Nickel, Tin, Cadmium and Stainless Steel Passivation. Be Cu does extensive gold plating, as this precious metal is still the deposit of choice for the most crucial applications. Tin, silver, nickel, copper and other metals are also frequently applied in our shop. Barrel plating is our standard technique. It is the best suited method for the miniature parts we specialize in. We plate to government specifications, as we are also on the certified vendor lists of several major corporations.